A fundraiser is underway to decorate the graves of thousands of soldiers in Keokuk National Cemetery with red-and-green holiday wreaths. The southeast Iowa cemetery contains graves dating back to the Civil War. Gary Folluo, of Keokuk, is heading up the effort to honor our nation’s fallen heroes. Folluo says, "The wreaths represent all seven of the military branches and they come with a red ribbon and they have a flag of the particular service." Folluo is one of the founders of Keokuk’s Sons of the American Legion and is general manager of Withers Broadcasting. The program, Wreaths Across America, began some 15 years ago when a Maine-based wreath company began placing wreaths on the headstones at Arlington National Cemetery during the holidays. The idea quickly spread to many other cemeteries. Folluo says people can donate 15-dollars for a single wreath or any dollar amount. Folluo says, "For every two that we purchase, the Worcester Wreath Company adds a third wreath. We have a little over four-thousand graves in our national cemetery. Our goal, obviously, is to try to cover all of them." The Keokuk facility is one of the original 12 national cemeteries dedicated on the same day as Arlington. Folluo says they’ll only be taking donations until Thanksgiving weekend. He says, "Our collection process is going to stop November 28th and we are going to make one check to Worcester Wreath Company and that’ll be the end of our purchase program for this year. This is a continuing program and we will be doing it next year and we encourage everyone in the tri-state area to participate." The local dedication ceremony and the placing of the wreaths will take place on December 13th at 11:00 AM. Every national cemetery and monument location participating in the ceremony in the U.S. will hold its presentation on the same day at the same hour. 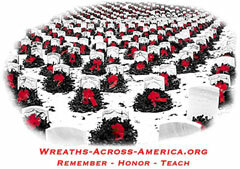 For more information or to donate, visit the Wreaths Across America website .